Back around 2009 a new type of investment machine started to take shape: the binary option. Also known as digital options, this type of derivative was a simplified version of regular options and soon started to catch on, especially with inexperienced users and mainly because it was advertised as very easy to trade and allegedly no prior experience was required. Literally, hundreds of new brokers started to appear but many of them didn’t even bother to list an address or information about the owning company, all their names were fake and regulation was out of the question. If the client managed to make some profits and wanted to withdraw, he/she was offered a too-good-to-miss deal and asked to keep the money on the platform in hopes of even bigger profits. Whether he/she agreed or not, the account managers would then proceed to open trades without the client’s authorization and deplete the entire account or in other cases, they would cease all communication with the client. How can you withdraw if the broker doesn’t answer your phones and emails? This behavior eventually led binary options to be called Scam as a whole and also triggered the emergence of Binary Options Recovery Services who claimed to “hunt” down the binary options scammers and retrieve the money from them through legal methods, in exchange for a fee or a percentage of the recovered money. We went out on a mission to try to understand how these “recovery services” work and who they really are. Are they the solution to your lost funds’ problem or are they just as bad as the brokers themselves? 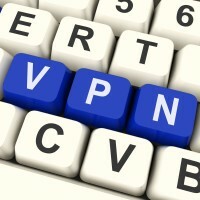 We will let you know what we’ve found out, the tactics they use and whether you will ever see your money back or not. So what exactly is this recovery business? Their offer is pretty straightforward and easy to understand: a solution for recovering money that’s been lost due to a binary options scam. Some recovery services also claim to hack social media accounts and to recover lost passwords (whether those belong to the client or to someone else), so as you see, their means are not always completely legal. Usually, a fee is paid upfront (for taking the case) or a percentage of the recovered amount, or both in some cases. The payment model varies depending on the website/service you’re choosing: sometimes you will pay them a time-sensitive fee (the longer they work, the more they get paid, even if they don’t recover any money) and sometimes you will pay only if they recover all or part of the amount you’ve lost. However, the initial fee is always paid. Finding them is really easy. Just sift through the comments section of any binary options related article and you will find someone praising the professionalism and high success rate of such recovery services, or you can even find the representatives of the recovery company itself advertising and sharing contact information. Google is also an easy way of finding a binary options recovery service. 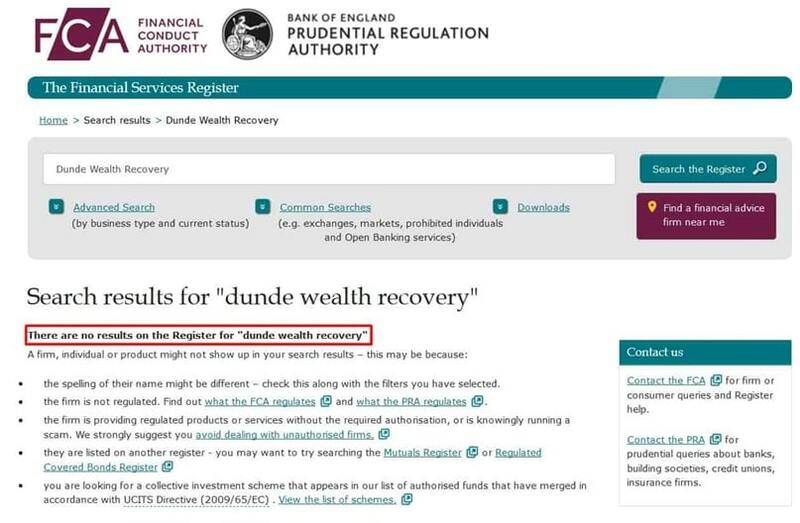 As you can see, Dunde Wealth Recovery is NOT regulated or registered with the British FCA. Another company, with a generic name this time – Binary Options Recovery Specialist – is providing a set of hacking services on top of their binary recovery offering, as well as credit score repair, but fails yet again to offer any type of credible information about them. And it doesn’t stop here: “Investigators247” is allegedly offering fund recovery services, social media account hacking, surveillance, infidelity/cheating investigation. You name it, they do it… or so they say at least. However, users of ScamWarners.com found that above mentioned recovery service was registered in Ukraine by a person named Qui Hoang, yet it listed only American phone numbers on the website. 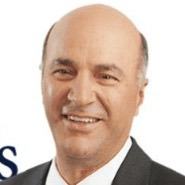 Another example is “Wealth Recovery Now”, which claims to be located in Ohio, offers a US phone number but it is actually located in Canada and the registrant doesn’t offer any name or contact information. 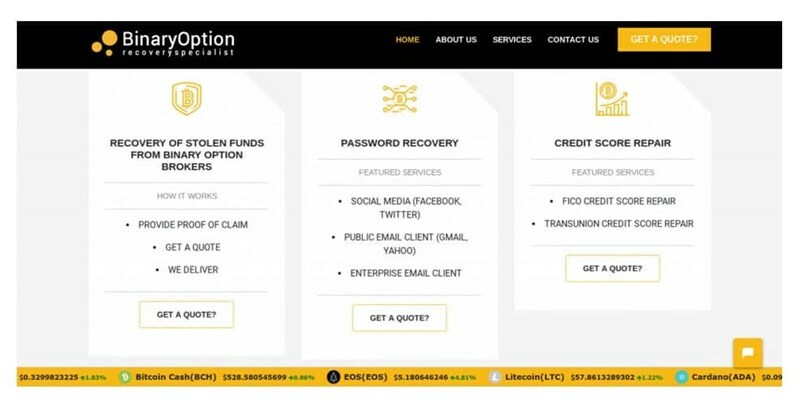 Yet this fake site boldly claims “Focusing on binary options, we have helped fraud victims from all over the world recover millions of dollars. The attorneys we work with have yet to lose a case using the intelligence we provide”. Obviously, no proof of their perfect record is delivered anywhere on the website. Over the top marketing has long been a staple of binary options brokers and now it seems that tactic is being used by recovery services as well. They all say they can get your money back, they are the best, the most professional and whatnot but luckily Google and Facebook have banned binary options marketing so the days of flashy recovery ads are over. The person that wrote the post in the pic claims to have lost $350,000 and then recovered it all with the help of a recovery expert. Then the poster proceeds to praise the “expert” and to offer his contact information for all to see and use. Just 2 posts below, another person claims to have lost $200,000 (successfully recovered with the help of another expert), then someone claims a loss of 65,000 Pounds and the thread goes on and on, with people who allegedly managed to get all their money back in exchange for a relatively small fee. Needless to say, these are all fake posts, with made-up usernames and let’s acknowledge the elephant in the room: they all have lost huge sums of money, which they then recovered. That’s only there to make you think: Well, if this recovery service can get back $350K, they surely can deal with my 5 or 10 thousand bucks. This way of hooking new clients is a recurring theme characteristic to all recovery services. Check this scary Quora thread that’s filled with tens of shills working for so-called recovery companies or services. By now you can clearly tell that most of these recovery services are just another scam that preys on the people’s desperation and hope of getting the stolen money back. But the good news is that most people are starting to see through the lies and thus avoid getting scammed a second time. A good example is this thread on ForexPeaceArmy regarding Birman Law and Wealth Recovery Int. The French Autorité des Marchés Financiers (AMF) warned against a certain Mr Villard, who claimed to be mandated by the AMF to help people recover sums invested in binary options platforms. In doing so, he was using the AMF logo, name and details fraudulently. See full warning here. And while the AMF issued a simple warning against a recovery con-artist, Leonel Alexis Valerio Santana, an impostor claiming to be an employee of the US Securities and Exchange Commission (SEC) was sentenced to 63 months in prison plus an additional 3 year probation period upon release. He was also ordered to pay restitution fees in the amount of $105,869.74. The sentence was issued by Judge F. Dennis Saylor IV of the Massachusetts District Court, in line with requests by the US Government. Under the guise of working for the SEC, the fraudster promised fund recovery and legal assistance to victims of binary options brokers but after the swift justice delivered by the US legal system, other such individuals will probably be deterred to engage in similar activities. Yes, there are some good guys out there but they are hard to spot in the multitude of scammers and impostors. The best way to avoid fund recovery scams is to not lose your funds to scammers in the first place, so whenever money is involved, make sure you are dealing with reputable companies that have been in business for a long time but more importantly, are regulated by a major financial authority. If however, you find yourself in the unfortunate situation to need fund recovery assistance, make sure you perform a thorough check of the company that claims to offer said assistance. Ask for verifiable information about the company, their employees and cases they’ve worked. Emphasis on “verifiable”! We cannot recommend anyone but a well-known law firm that also specializes in this type of fund recovery is Giambrone Law. They have received numerous international awards and have offices in more than 10 cities across the globe, so we can assume they are not out to scam you but as mentioned prior, you should conduct your own review. The last thing anyone wants after being scammed is to lose more money chasing the lost amounts. There are many ways to know when you are dealing with a recovery service scam, but the best one is to just use your common sense. Ask yourself how did you come across the company. Was it through a poorly written forum post or comment? Can you really believe a guy who says he recovered a quarter million US Dollars with the help of a company with a Gmail address? Bottom line is: most of these recovery services will simply scam you out of more money and you will never see the initial funds back. If you really want to chase the people who stole from you in the first place, go to the authorities or go to a big, well-known law firm. Getting scammed once is bad enough! Great information. Many thanks for all of your help from someone who has been scammed! Very best of wishes. Finally someone speaks the truth about these services. I had a strong hunch that most recovery firms are simply the sequel for the broker’s scam so I get scammed twice. But i never took the time to make a big research like u did and i almost got fooled by them because i was scammed before and was looking for a way to get my money back. At least now i wont get scammed twice. Thanks guys for clearing it up!